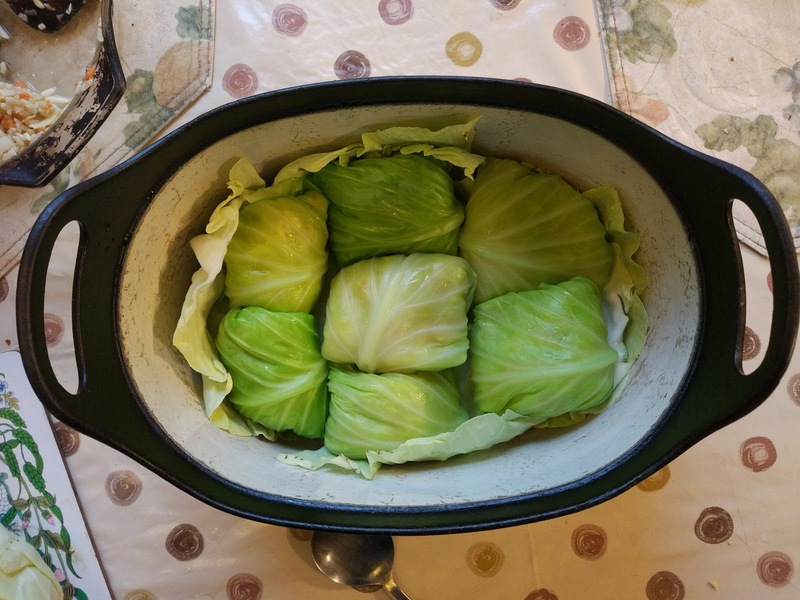 Stuffed cabbage leaves are a dish that my Grandmother has made for a long time. She learned it after the war, from a lady of Russian extraction in London. As far as I know it's a recipe popular in Poland, other parts of Eastern Europe and Turkey. There are countless ways to make them, fold them, and cook them, but two things remain constant across the recipes and countries: Cabbage for the outside and rice for the inside. There are three parts to the recipe, and should be made in this order.The Sauce, The Stuffing and finally The Cabbage. You have to Stuff them and then its time for Cooking! 1 cabbage, 2+ tomatoes, 1 and a half onions, 1 carrot, 1/2 courgette, 2-3 cloves of garlic, 1 stick celery, butter, salt & pepper, stock or bouillon, a bay leaf, beef mince OR 150g cheddar & an egg + optional herbs to taste. Put this on before you start. Its basically a tomato flavoured broth, that should have had some cooking time before it all goes in the oven. The tomatoes add a slight acidity which complements the fattiness of the meat/cheese and softens the flavour of the cabbage. The point of the sauce is to bring the flavour out of the stuffed cabbage leaves while it contemporaneously cooks them. If its a bit insipid add more vegetables to it or add other herbs like oregano and thyme. half an onion, sliced into thin half crescents. 2+ tomatoes, diced (You can use canned tomatoes instead but make sure to cut them up small so the sauces isn't too lumpy). 500ml chicken stock OR you can use bouillon with 500ml (you can use only water, but I would definitely not omit any of the vegetables above) . Put the butter in a saucepan, when it starts to melt add the onion and brown them. Then add the garlic and courgette, let it fry with the onion for a minute or two, add the pepper, then add the tomato, stirring. Make sure its not too hot as you cook the tomato so it doesn't burn. 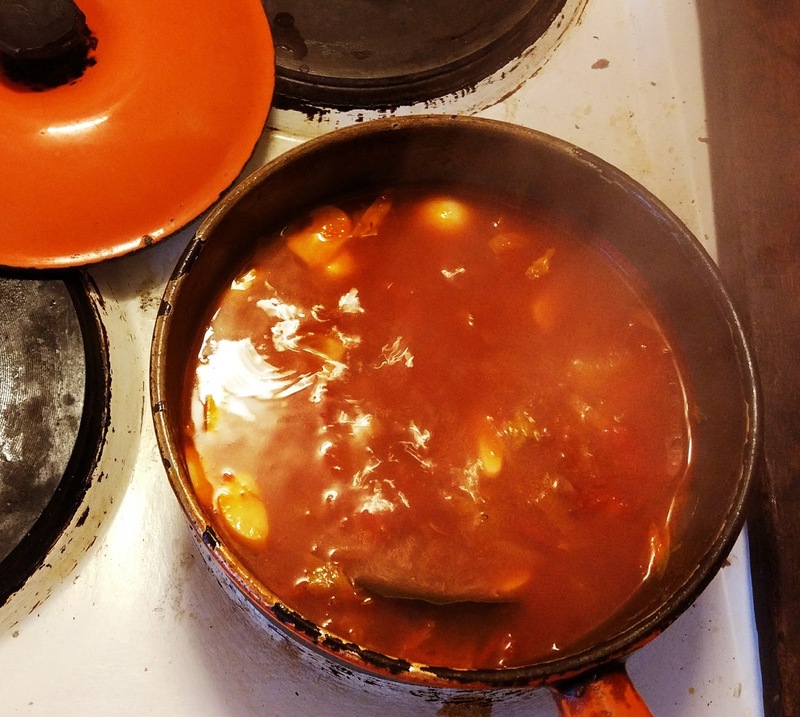 You want the tomato to break down and dissolve, so put the lid on, and let the sauce cook. Leave it for 10 minutes, stirring occasionally. Once there's a nice thick tomatoey sauce, pour in the stock, and add the bayleaf and celery. Let it simmer while you're preparing the other ingredients. 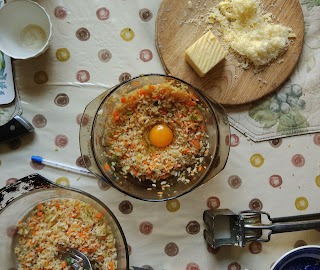 The basic principle of the stuffing is the same, rice + diced veggies + extra flavours. The vegetarian version is absolutely delicious and I would say better than the meat version in flavour. But if you want an *exceptional* meat version you can use half-cooked rice - this absorbs the flavour of the meat much better. Once all the ingredients are sliced and diced, put them in a bowl and stir them together, the consistency should be sticky to the point of clumpiness, if its not, add more egg or meat. Depending on your country, season and shopping options, there is a large variety of cabbages to choose from. What you want is one that has strong, big leaves that are easy to bend. From the supermarkets, the best one I found was called "sweetheart cabbage". The usual "white cabbage"'s leaves are very tightly wrapped and often tear when you try to remove them. However the best cabbage for making this dish is Turkish Cabbage. It looks like a squashed normal cabbage with wide, thick leaves that are the easiest to remove. Go to a Turkish shop to find one! Remove the biggest leaves from the cabbage, and leave the smaller ones for later. Before you fold the leaves, you need to blanch them to make them softer and more maleable. 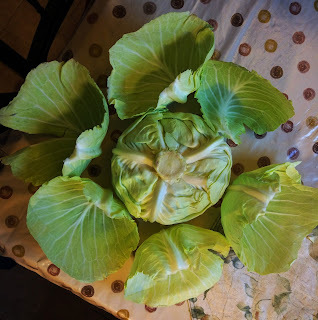 In a large pot, bring some water to the boil and put in the individual cabbage leaves for about 2-5 minutes or until they start going bright green. Then put them immediately in cold water, this will preserve the colour. Sometimes the stem is very thick and this makes them hard to fold, you can slice a part of it off to make it easier to bend. Get a large pot or casserole dish which can go in an oven. Put the oven on at 180°C. Put half of the left-over small cabbage leaves at the bottom of the pot, then pack the stuffed cabbage leaves in. The tighter the better. You can do two or more layers. Pour the sauce over the cabbage so it covers them to at least 3/4 height. If it doesn't add water or more stock. 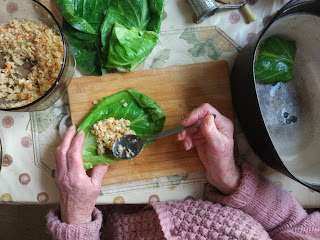 Then, cover it all with the remaining small cabbage leaves. Then put the lid on the pot and put it into the oven for 45 mins-1 hour. While its cooking, check it once or twice for liquid and add if it seems dry.